After 18 months of silence, Yager Developments and 2K Games are finally putting their narrative-driven third-person shooter, Spec Ops: The Line, in front of outsider eyes again. 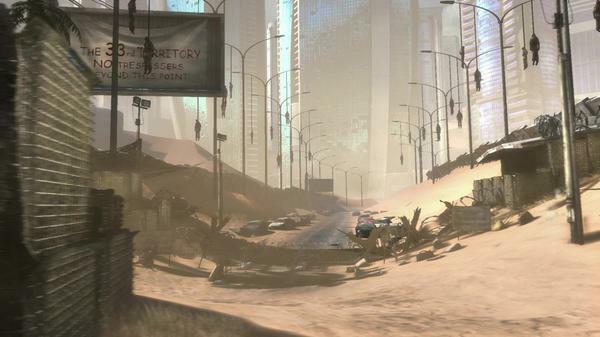 The game was first revealed at E3 2010, looking on paper like another brown military action game set in a desert environment. This one had more naked emotion than most, and a fair amount of grit to roughen its smooth skin, but it was very much what it was also supposed to be: an E3 first look. The game emerges from the shadows now looking even more haggard than before, and all the better for it. Protagonist Martin Walker and his two squadmates tread an uneven path through the sandstorm-ravaged streets and highrises of Dubai, one filled with difficult choices and unlikely enemies. They’ve been sent to locate the AWOL battalion commander, Colonel John Konrad. He and his soldiers were the first sent to assist in the ruined city’s evacuation efforts, but contact was cut off when the order was given to pull out and Konrad refused. Walker and his team arrive to find themselves facing off against a brutal yet charismatic madman with a misplaced sense of honor and a battalion of American soldiers willing to lay their lives on the line for him. I recently sat down to tour through a 90-minute summation of gameplay and plot developments over roughly the first half of the story, and the interactive narrative Yager’s assembled definitely seems to deliver. Spec Ops might initially seem somewhat vanilla on paper, but there’s a definite craft behind its moving parts that makes it stand out. There’s a sense that narrative frequently gets to take precedence over gameplay, though based on what I saw it never comes at the expense of either. On the contrary, the two feel as though they’re interwoven in some genuinely creative ways. It’s a rare thing to witness in a game with this kind of blockbuster potential, similar in certain ways to Uncharted, only with a vastly different, and much darker, tone. That marriage of gameplay and narrative is key to pulling off the development team’s goal of delivering an affecting interactive experience, as I learned in a post-preview chat with some of the key players behind the scenes. The preview got me thinking about Six Days in Fallujah, the tactical shooter developed by Atomic Games that Konami was to publish before controversy brought all work to a halt. The game was intended to offer a playable chronicle of one real-life Marine squad’s experiences during the Second Battle of Fallujah in 2004. Spec Ops lead writer Walt Williams cautioned me when I asked for his thoughts the cancelled game, explaining that documentary-level realism is not something Yager’s game is shooting for. “We wanted to create a hyper-realized kind of world that would… essentially heighten what the player is feeling, emotionally,” Williams explained. Hearing this, I quickly realized that my Fallujah comparison was a knee-jerk response. Uncharted is really the more like-minded sibling. Its gameplay and tone may be different, but it is a series that depends on its narrative flow to propel the play. Spec Ops has that same sense of delivery, the feeling that you’re “playing” a blockbuster movie. If Uncharted is analagous with Indiana Jones then Spec Ops is more in tune with something like, say, The Hurt Locker. The tricky part for Yager is navigating the murky waters of controversial subject matter and a story that is inspired, in large part, by Joseph Conrad’s Heart of Darkness. The Line‘s narrative ambitions are huge, which has led the dev team to keep its sights firmly locked on the video game medium’s most difficult target: a player’s emotional center. “I think one of the things that’s super important with touching on these themes is that we take them very, very seriously and we try to treat them with respect. What we’re trying to do is not exploit the player or just provoke some sort of disgust or something like that type of emotion, but, more than anything, allow [the player] to sort of put himself into those situations,” lead designer Cory Davis explained. Davis referred then to a decision I was forced to make during my preview. Konrad had two men strung up above the sand by their wrists, with sniper squads targeting each one. On the right was a water thief, battered after his arrest and awaiting execution for his crime. On the left, the soldier who apprehended him, disgraced for an overzealous arrest that resulted in the death of the thief’s family. I’m left to choose which man should die, by my own bullet. I went a different way during the preview, taking aim on Konrad’s snipers and opening fire. A pitched battle ensued as more unfriendly forces came running over the sand dunes beyond the two doomed men. During the interview later I learned that I could just as easily have made any number of other choices, from playing by Konrad’s rule to shooting the rope to simply walking away. “[That decision] was not necessarily about which way the game diverges, it was more about you and the choice that you decided to shoot those soldiers said a lot about you. We hope that it helps you to stop and contemplate and think what that means for you,” Davis explained. It’s not enough to have those decisions. They need to mean something too, but Yager is taking care not to influence decisions in one direction or another with dangling carrots. There aren’t even any in-game Achievements or Trophies to motivate your decision-making; such rewards are present, of course, but the story-related ones simply chart your progress through what is, at its core, a linear tale.